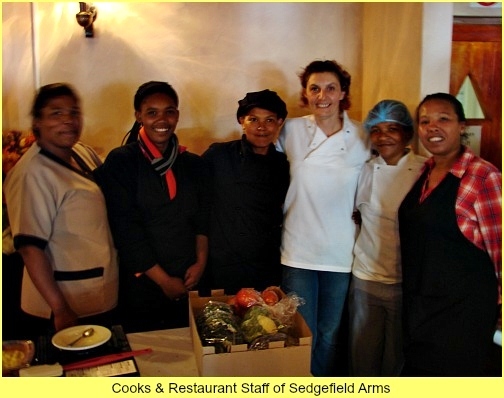 The “Best of British” Slow Food Workshop was held at Sedgefield Arms in August. Douglas Green is one of South Africa’s largest producers of quality wine. 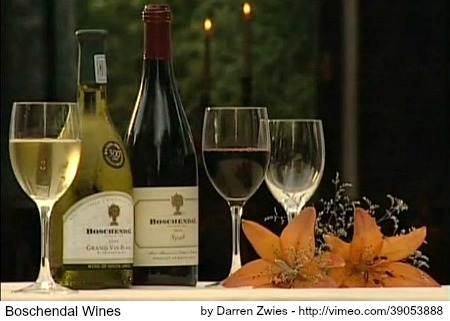 Their wine making and bottling cellar is located in Wellington in the Western Cape. Included in their stable is the prestigious Boschendal Wine Estate. 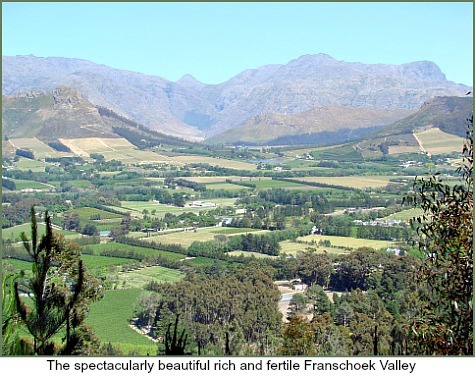 The Boschendal vineyards were first pioneered by French Huguenot Jean Le Long in 1685, and in time, owned by Cecil John Rhodes in 1887 with De Beers Mining Company managing them after his death. They were sold on and later purchased by Anglo-American Corporation in 1969. 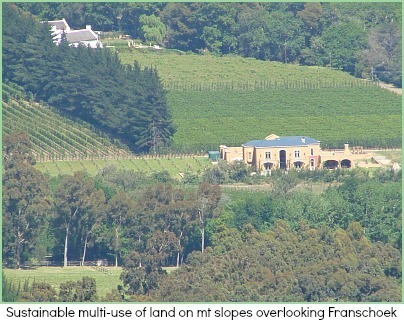 In 2003 the estate was sold to a consortium of environmentally conscious property developers who decided to outsource the winery and tasting centre to Douglas Green who have been running it since 2004. Russell said that the Boschendal Estate 1685 wine is the older iconic wine, a blend of Chardonnay and Pinot Noir grapes, the former providing the richness and backbone and the latter, the fruitness and touch of spice flavour. The pale red coppery colour of this historic wine was the forerunner of the Rosè blends. It is an easy-to-drink wine that happens to be a major export to the UK so that it fits into the Best of British theme of our workshop. Everyone had arrived in good spirits and was chatting away companionably as Chef Colin demonstrated to those who were interested how to make Yorkshire pudding which I don’t know how to make and have never tried. The recipe is so easy I’m now keen to give it a go. Here it is! With a cup or measure of your choice (depending on how many you’re making it for) use equal amounts of the following e.g. Whisk to mix thoroughly and add a teaspoon of vinegar to the mixture just before it goes into the oven. NB .Do not increase the amount of vinegar even if you decide to make a larger amount of the mixture. Preheat the oven to 200°C. The pan for the pudding should be preheated too and then a thin layer of fat placed in it and around the edges. 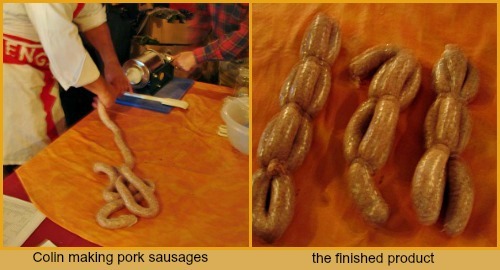 The browned sausages should then be added and allowed to cook through along with the pudding mixture. Colin used the Yorkshire pudding to make Toad in the Hole and so continued to demonstrate how to make one’s own pork sausage. He used a pork shoulder and some bellies that were minced twice. Rusk was added which is, in effect toasted breadcrumbs. Mustard seeds soaked in Port were put in next to give flavour and then lastly, a bit of iced water is mixed in. 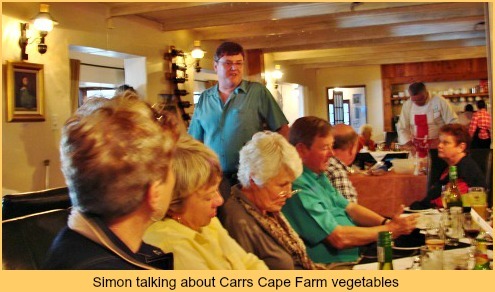 While Colin went into the kitchen to complete his Best of British dish, Simon Carr of Carr’s Cape Farm up at Elandskraal just outside of Sedgefield told us how he came to Knysna in 1999 and bought his farm in 2001. In 2004 he started growing vegetables on 1½ ha. 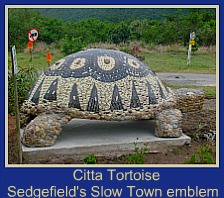 To begin with he sold his produce to the local Pick ‘n Pays, Spars and Fruit and Veg outlets from Mossel Bay to Plettenberg Bay. However, when the economy slumped in 2008, they paid him too little for it to be viable and his marketing strategy had to change. Now he sells direct to the consumer and only delivers small amounts to local shops when requested. 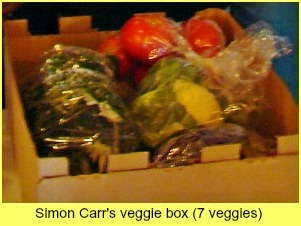 The advantage is we can get a box of very fresh produce i.e. the day it is picked, direct from the farmer to our table. Currently 7 vegetables e.g. tomatoes, spinach, leeks, spring onions, cauliflower, broccoli and red cabbage cost R50. The boxes are delivered to Choice Estate Agency in the Plumtree Trading Post complex in Sedgefield and can be collected from there around 11am in the morning. Phone Simon on 044-343 2273 (ideally the day before) to place your order and to not be disappointed as the produce needs to be picked early and then packed so it can be in town before lunchtime. Then the Best of British main course ready to eat – the food was excellent as it always is. 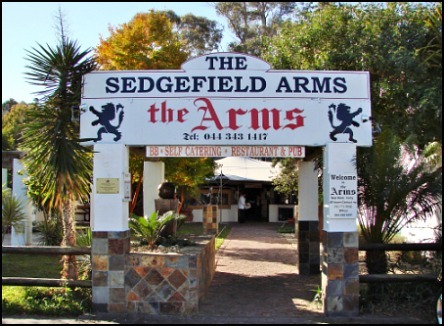 Sedgefield Arms made Irish stew with dumplings and Colin had done Toad in the Hole. Other Slow Food members contributed Savoury Cauliflower Cheese, Bubble and Squeak, Cottage Pie and Liverpool Potjie. 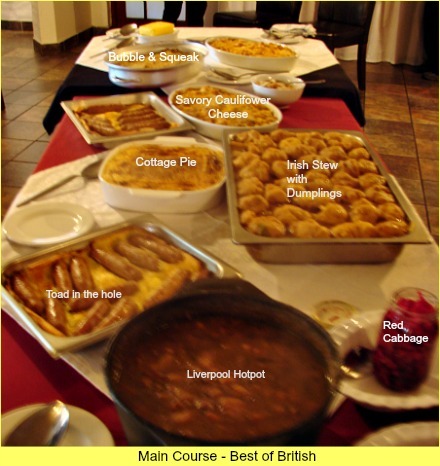 I’m going to mention Pat Moore’s Liverpool Hotpot/Potjie or Scouse because she went to some trouble to explain its origins. “Lobs Kause” (or louts’ course) was the Dutch/Scandinavian seamen’s fare when they were in port and probably refers to the mayhem they caused whilst their ship was docked there. It was ideal food for those with no teeth or bad ones due to scurvy. It consisted of meat, potatoes and root vegetables cooked slowly in stock or water until they were a tasty moist mix, similar to an Irish stew. Served in bowls and eaten with a spoon it was accompanied with crusty bread and butter, pickled red cabbage or beetroot. Having made the meringue and biscuit base for the Banoffee pie, Colin demonstrated the finishing touches. He spooned on some caramel treat followed by chopped banana, then some whipped cream, more sliced banana, some crumbled ginger biscuits, more banana, then a mixture of caramel treat and whipped cream and finally he added some caramelised sugar for decoration. It looked so yummy, it definitely qualifies as a Best of British recipe! 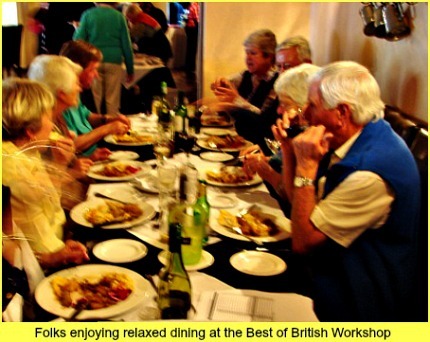 Other Slow Food members had contributed Rice Pudding, Apple Crumble with cream, and Scones with strawberry jam and cream – you can’t get more British than that! What fabulous food we enjoy at these Slow Food Workshops. The atmosphere is great too. Thanks to our Best of British celebrity chef, Colin Capon who made several components for his dishes on the spot in front of us! 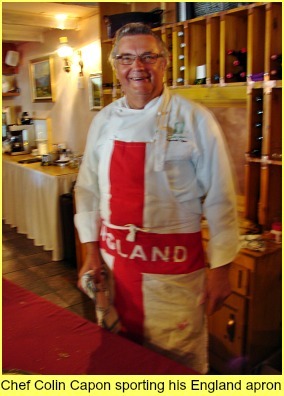 Thanks also go to all who participated and Sedgefield Arms for hosting the Best of British Slow Food Workshop. The restaurant staff were fabulous, cheerful and helpful and the cooks Eunice, Ellie, Honey and Mechele produced the sizable and very tasty signature dish. Boschendal Wine Estates are committed to the conservation, preservation and restoration of our environment by implementation of biological farming practices that promote a habitat of biodiversity both in the vineyards and surrounds. Almost half of the total land has been set aside for conservation with a dedicated investment in our environmental management strategy.